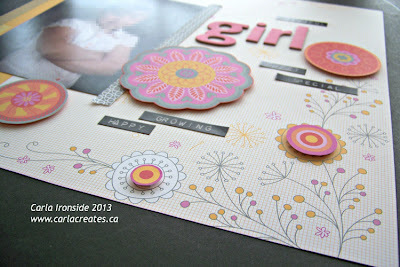 Love how this came together -- the paper is from Dream Pop from CTMH. I cut out the floral elements from a different one of the kit's patterned papers and popped them up here with foam tape for embellishment. The washi-tape 'looking' strip is actually a strip of paper from the collection as well. The chunky alphas are Bo Bunny and the journalling strips are K&Company. This is so pretty! I love those embellishments! Awesome job Carla! Pretty layout! Mood luck with your crop!